We’d love your help. Let us know what’s wrong with this preview of The Australian Heritage Cookbook by Ellen Argyriou. This beautifully illustrated cookery book caters for every occasion - from spontaneous entertaining and family cooking to more extravagant recipes for that special dinner party. In compiling this book the editor had a wider vision than that normally restricted to basic cooking recipes and food photography. Here is a book which can be used by the basic cook at home or it can This beautifully illustrated cookery book caters for every occasion - from spontaneous entertaining and family cooking to more extravagant recipes for that special dinner party. In compiling this book the editor had a wider vision than that normally restricted to basic cooking recipes and food photography. Here is a book which can be used by the basic cook at home or it can be given as a gift to special friends, both in Australia and overseas. The beautiful photography covers all States and Territories of Australia and gives our international friends a window to our lifestyle, both living and eating. 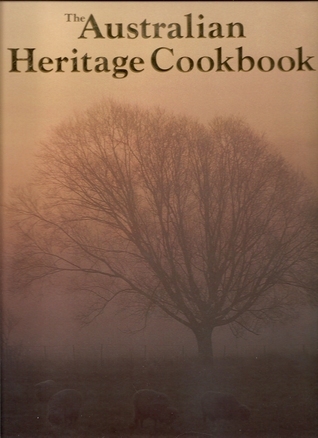 To ask other readers questions about The Australian Heritage Cookbook, please sign up. Fun cookbook from the 1980's...has Australian recipes, plus great photos of food and Australia. I recommend it to foodies and Australia fans. Lovely recipes and beautifully illustrated. The book is too heavy (and too lovely) to cook from directly, so I usually copy/scan a recipe.